Mary Russell and Sherlock Holmes have returned from their year-long trip, finally able to return to their Sussex home. However, distressing news reaches them on the train: one of Holmes’s beehives has swarmed, its hive completely abandoned. He marches straight for said beehive on their return, completely baffled. He contemplates this and he and Russell return to the house, only to find an unexpected visitor waiting at their doorstep: Damian Adler, Holmes’s illegitimate son, come to ask Holmes for help in an investigation to find his missing wife and daughter. After talking with for the better part of the night with his son, Holmes and Damian take off for London, leaving Mary with nothing to do but deal with the mystery of the missing bees. 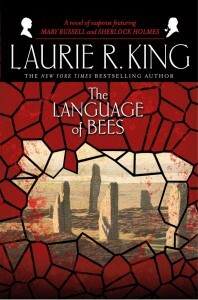 And so sets the plot for The Language of Bees by Laurie R. King, the 9th book in the Mary Russell series. I skipped a few books, since I had my ARC of God of the Hive arriving in the mail, but it was a good jump; I missed their year-long abroad adventure, but it had very little pertinence to the story. I would say this is a book easy to pick up assuming you’ve read The Beekeeper’s Apprentice and A Monstrous Regiment of Women, though I would recommend also reading A Letter of Mary before you tried to jump to this book. Let’s get the bad out of the way first: the book is too long. After comparing its page count to that of the other Russell novels, it’s not that much longer than most of them. That didn’t stop it from dragging in places, particularly in the beginning. Just like I observed with The Moor, the plot and story are not near as entertaining without the presence of Sherlock Holmes. Although Mary is a well-rounded, developed character, she is a character developed to be part of a whole. Without Holmes she lacks something. 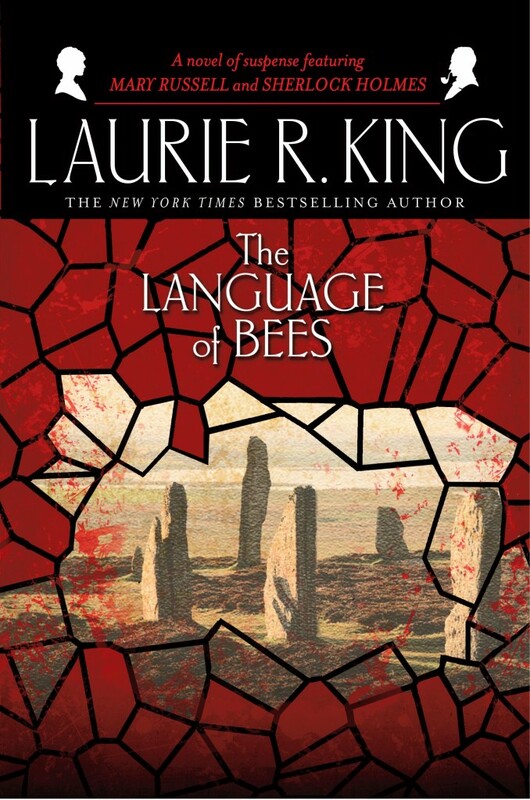 She solves the mystery of the bees fairly early in the novel, but that was the hardest part for me to get through. Although King kept us informed of what Holmes and Damian were up to with small dialogue-only chapters, it wasn’t enough to keep the tension alive in the first third of the book. Once Mary ends up going to London, doing some investigating, and then returning to Sussex to find Holmes waiting for her, the novel takes off. Once the investigating duo is working together, the plot accelerates; the formula works better when they are a team. When the story starts to wrap up, it takes you a little by surprise; it feels like it lacked a charged build-up, but the book stayed at a very good even pace. The only major exception to this is Mary’s plane trip to Scotland. As amusing as it was, three chapters of travel was difficult. This book handles the Holmes and Russell relationship very well. They’ve now been married three years, and you get the feeling of just how unusual their marriage is, and yet very appropriate for them both. There are rare moments of affection, or they are mentioned in passing; any other show of passion would be out of character for them both. When they are reunited in Scotland near the end of the book, Mary hits him, yells at him, hits him again, then hugs him. It’s their ideal relationship. As Mycroft voices to Mary, Holmes has let 4 people into his life: he himself (Mycroft), Watson, Irene Adler, and Mary. You can feel that, and you know that’s true. This was not a simple plot. Every red herring felt like a legitimate lead, and sometimes a red herring became a legitimate lead again after being eliminated. The mystery was fascinating, if not slightly disturbing, with a low-key climax. I think that’s partially because the cliffhanger is so huge and open-ended that it overshadows the book’s climax. So, even with the overly wordy parts of the book, I enjoyed it. None of them have struck me with the same wow quality that Beekeeper’s Apprentice did, but Language of the Bees was plenty satisfying. I can see mostly how the title and the bees subplot tie to the main plot, but with a title like God of the Hive coming, I can’t wait to see where it leads.